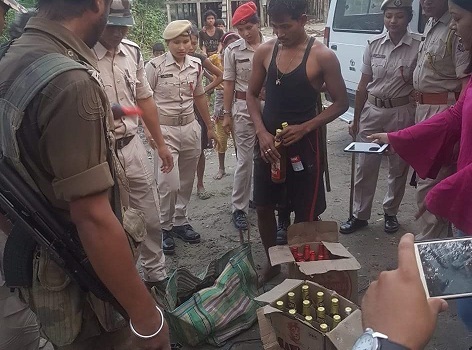 Successive raids against alcohol in river island district of Majuli in Assam on Thursday led to major seizure of illicit liquor from several joints in the district. A joint team under the command of Additional Superintendent of Police (ASP) Amar Chaudhary and Assistant Commissioner Nitisha Bora led a team from Garamur police station under officer in charge Ranjan Doley and excise team under Excise Circle Inspector Arun J Bharali made serial raids at Balisapori, Silakola, Selek and Dhunaguri ghat areas and recovered huge cache of Arunachal made foreign liquer/beer and also destroyed approximately 150 litres of illicit liquor. The team also destroyed degenerated molasses which is used for manufacturing of illicit liquor at Balisapori and Dhunaguri areas and warned the hoarders of degenerated molasses for stocking of degenerate molasses. Also the team interacted with locals and made them aware of the ill effects of alcohol usage and abuse.